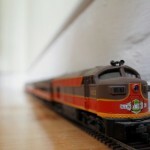 Fed up with watching the trains in your railway set go around and around in an oval? Want a bit more variety? Here are five ways to add interest to railway set. Although my main model railways are permanent affairs on baseboards, I have railway sets that I occasionally just set up and just tinker with on the floor or table. Usually, I’m just trying out a new train or experimenting and as such these layouts are just the standard oval configuration. But after a while these get so dull! This was exactly the predicament I found myself recently. I’d got a couple of new wagons and wanted to try them out but just watching these go around and around and around just didn’t do my lovely new wagons justice. The same applies for children’s toy train sets, all too often I see them just set up in a circle with children getting board. There’s so much more that can be done. When first starring out with a train set many beginners stick religiously to the track plan instructions that come in the box. If this is you you’re missing a world of possibilities! Tear up the instructions and let your imagination run free! Get as much track as you can – the Hornby track expansion packs are ideal for this – and just hook them together wherever the curves and points take you, as in the video below of Jim Zimmerlin’s wonderful railway. Note: This approach works equally well for the toy train sets for young children. Just get lots of track and let them play, there’s no restriction for wooden and plastic railway circuits and how they can be arranged. I once built a Thomas train set with 70 feet of plastic track that ran in and out of 3 rooms and the hallway of the house. Admittedly hoovering around it was a problem but my son had an epic time building it with me and following the trains trundling between the rooms! But you can do a lot better! Why stop at a simple single entrance and exit? Enter stage left the Rabbit Warren. This is a layout introduced by C. J. Freezer, long-term editor of Railway Modeller magazine and consists of a loop with much of the track and curves hidden from sight in multiple openings. Trains in rabbit warren layouts make their way around the layout, disappearing and emerging from the different openings adding interest as viewers are left to wonder where the train will appear next. Who doesn’t like a train going over a bridge?!? 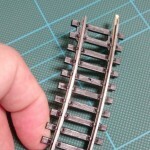 While you can buy bridge assemblies for railway sets there’s nothing to stop you creating your own. Building a bridge is simply a case of gradually raising the height of the track and supporting it over a gap. You’ll need pay attention to the angle of the incline so its gentle enough for your train to climb, if electric, but otherwise a section of rail over a gap or elevated over another section of track is all that’s needed. For young children train sets Lego / Mega Blocks are ideal aids for Brio,Big Jigs and Thomas toy trains while for Hornby sets there are dedicated elevated track supports. Trains exist for one reason. To carry things, A to B. The things can be cargo – coal, minerals, liquids, livestock or freight – or people and for most of us it’s cargo that is more interesting. My wagons being a case in point. So adding sheds, depots and the loading bays gives a railway purpose and meaning. Get the Hornby sheds and loading cranes and yards and add some life to your railway. 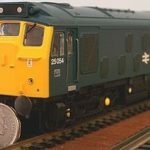 There’s plenty of choice for toy trains too. There are some great industry accessories for Thomas. Alternatively, if people are your thing, there are plenty of stations available that your trains can ferry passengers between. If you’re feeling creative and up for an engineering challenge perhaps the most fun is to mash up your train set with that other classic toy, Lego! Lego bricks are super easy to work with and you can construct just about any building from them but there’s a whole lot more you can do. With Lego “anything is possible”. Just take a look the video I covered here for proof. Now I’m not suggesting for a minute you build a railway in Lego rather than Hornby but there’s nothing to stop a mash up and having the best of both to create a crazy fun layout. Picture: Jim Zimmerlin, top video.